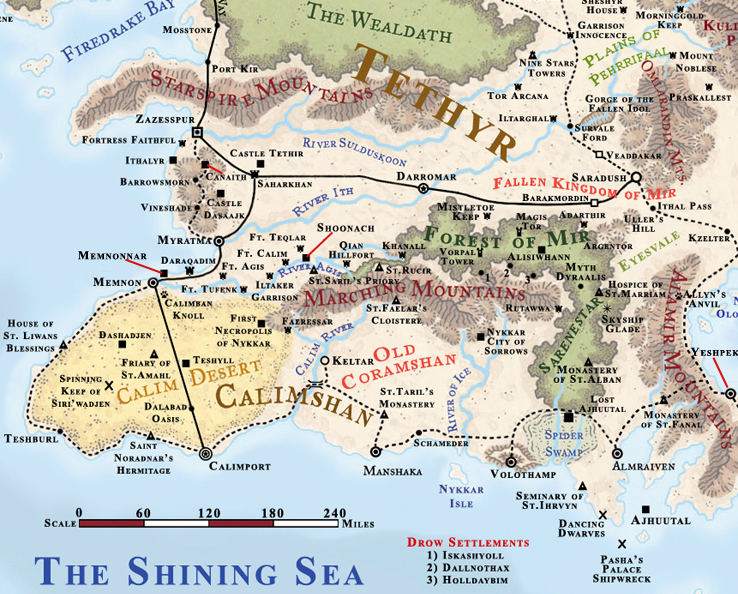 South of the Western Heartlands and west of the Vilhon Reach are the Lands of Intrigue: Amn, Calimshan, and Tethyr. Tied to each other by geography and a long history of invasions, conquest, and competition, the people of these countries have survived by wits and sword, learning to guard their true feelings and present a pleasant face to their enemies. All three of these large, populous nations rely heavily on trade, particularly with distant countries. Their lands contain a wide variety of terrain, making them home to an equally wide variety of monsters. Amn is a nation of merchants, a place where caravans start and end and ships leave for exotic ports and return laden with gold and strange items. The Shadow Thieves have their hand in everything, and the rulers are an anonymous group known only is the Council of Six. Divine spellcasters are respected if their work brings money to Amn, while arcane spellcasters are universally reviled and feared. Amn maintains a large colony on the distant tropical continent of Maztica and has profited greatly from its trade. The government's disregard for the humanoids in its southern mountains has come back to haunt the country; two ogre mage leaders forged an army and took over much of southern Amn, including its secondary port city. Now Amn struggles to retake its territory while maintaining its trade routes and dominance in Maztica. The people of Amn are obsessed with wealth. Unlike their southern neighbors, who pursue wealth for the comfort it brings, Amnians desire wealth for its own sake and for power, using the money they acquire to create more riches for themselves. Also in contrast to Calimshan, the wealthy in Amn make a great show of donating money to charities and the needy. Large donations demonstrate that a person can afford to be generous. Everything a citizen does should be done for money; doing something unprofitable is considered foolish and wasteful. Amn's economy is supported by strong guilds, controlled by powerful merchant families who have a great deal of wealth and political clout Every aspect of trade or craft is covered by a guild. Amn is a great plain between two parallel mountain ranges. Four broad, slow rivers wind across its lowlands, laden with trade goods. The Cloud Peaks: These mountains mark the northern border of Amn. Despite being home to white dragons and remorhazes, they are mined for iron, precious metal and even some gems. A pair of steep crags known as the Fangs guards the Trade Way leading to the Sword Coast lands. Lake Esmel: This dark blue lake plummets to unknown depths in the central southern, and eastern portions. Hot mineral springs flow in the western shallows, making it a popular vacation spot and health resort for the wealthy. Rumors speak of an aquatic monster in the lake, but most dismiss them as sightings of Balagos the Flying Flame, a red great wyrm legendary for his gigantic size, temper, and recklessly hurled spells. Shilmista: The elven king of this area, also known as the Forest of Shadows, has declared that no more trees or elves of his realm shall die, and slays any who violate his order. Only one tribe of elves remains, and its members prefer to stay in small, hard-to-find camps rather than in larger settlements. The tribal leaders have established a tenuous contact with the rulers of Tethyr that may ease their paranoia. The Small Teeth: This range of mountains was considered a nuisance because of the number of evil humanoids and giants living here, but now it is the backbone of the Sythillisian Empire, an area of conquered Amnian territory ruled by two ogre mages. The peaks are home to Irykiathagra "Sharpfangs," a blue wyrm that awakens about once a century, and the Twin Towers of the Eternal Eclipse, two fortifications dedicated to the church of Cyric. Snakewood: This place's name comes from the black and green snakes that live here. Clerics of Eldath inhabit the central woods despite isolated pockets of monstrous spiders, giant snakes, beholders, and lycanthropes. An ambitious green dragon named Ringreemeralxoth lairs in the northeastern portion. Troll Mountains: Rich in gems and full of mysteries, these mountains are mostly unexplored due to the predations of the monsters from which they take their name. The trolls here are unusually clever and well organized, and once ruled a small kingdom of their kind. The mountains are also home to the red dragon Balagos the Flying Flame, a temple of Talos that is struck by lighting daily, and the fortified gnome mining village of Quarrelshigh. An enormous vertical slab of rock four thousand feet high in the western portion of the mountains is carved to resemble a dwarf. Known as the Wailing Dwarf because of the noise of wind blowing through its hollow eyes, ears, and mouth, it marks the site of a fallen dwarven city and is now inhabited by trolls and other monsters. Amn is heavily settled, especially along its great rivers and around Lakes Esmel and Weng. Inns and taverns catering to the Trade Way traffic line the road for the length of its passage through the country. Athkatla (Metropolis, 118,304): This city is the seventh busiest port in all Faerûn. Any sort of nonmagical good can be found here for a price. Because this is Amn's only remaining free port, ships from the western land of Maztica dock here, bringing back exotic vegetables, fruits, jewelry, and large amounts of gold. The city's marketplace is twice the size of Waterdeep's. Above the bay is Goldspires, a temple to Waukeen nearly as large as a small town. Eshpurta (Large City, 24,252): Although the rich in Athkatla consider this city a backwater, Eshpurta is proud of its status as Athkatla's main military city. It has more business devoted to the military (including the manufacture of arms and armor), than most other cities in Faerûn. The city also mines iron from the southern foothills of the Troll Mountains; Eshpurta has a quiet temple to Ilmater, an oddity in Amn. Keczulla (Metropolis, 47,322): Settled hundreds of years ago when gold and iron were found nearby, the town fell on hard times two centuries later when those mines were depleted, only to rise again fifty years ago when gems were discovered. The city houses a secret cabal of benevolent mages, who keep their skills hidden from all but each other. 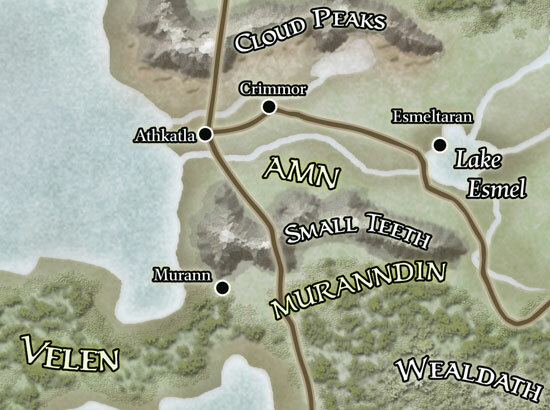 Murann (Metropolis, 43,773): The secondary port town of Amn, Murann is now fully in the hands of two ogre mages and their minions. The city's alchemists' guild remains intact, its members creating alchemical items and potions for the armies of the Sythillisian Empire. The humanoid armies seized the gold-laden ships and are now quite wealthy, and the Nelanther pirates and the Tashalar-based Rundeen use the place as a safe haven in exchange for defending it against naval attacks. The church of Selûne crusades relentlessly to see the city reclaimed, since they have a large temple here. Purskul (Metropolis, 27,210): A granary city, Purskul is a significant caravan stop. Orcs were enslaved here over a hundred years ago, with the hardest workers earning their freedom. The half-orc population (15% of the total population) works as mercenaries and caravan guards. Purstul's temple to Chauntea remains empty after its resident clerics died of sickness two years ago. Humans have inhabited Amn for thousands of years, but only with the rise of the Shoon Empire did the place become a unified nation, reaching its current borders in 768 DR. During the rise of Shoon, most of the elves in Amn's forests were killed or enslaved, a fact that has not been forgotten by the elves living here today. With independence, Amn became a center of trade, and its people became wealthy and prosperous. A series of plagues and monsters released by certain schools of wizards has led Amnian citizens to hold a very poor opinion of arcane spellcasters. Amn is ruled by the Council of Six, anonymous overlords who share their identities only with each other. The Council of Six made an accord with the Shadow Thieves, an exiled Waterdhavian guild of thieves and assassins, and the two organizations have prospered since then (in fact, a member of the Council leads the Shadow Thieves). Mercenaries, in the employ of Amnian merchants discovered Maztica in 1361 DR, sparking a veritable gold rush whose effects continue to grow with each passing year. In 1370 DR, two ogre mages named Sythillis (LE male ogre mage Sor12) and Cyrvisnea (LE female ogre mage Ftr12) gathered an army of goblins, kobolds, ogres, and hill giants (backed by worshipers of Cyric) to attack the southern cities of Amn, with the ultimate goal of acquiring Maztican gold from docked ships in Murann. They succeeded and have since held the southern portions of Amn despite various efforts by the Council and adventuring groups to dislodge them. At nearly the same time, two southern Amnian cities defected to Tethyr, seeking better treatment and more freedom. Only a year ago, folk would not have thought of Amn as a land in great need of adventurers. With the rise of the monster-lords in the south of the land and the pervasive influence of the Shadow Thieves in all aspects of Amnian trade, that is no longer true. The Masked Prisoner: One of the Council of Six was in Murann when the city fell to monsters and has not been seen since. He is presumed to be the prisoner of the ogre mages and perhaps is being tortured for information. Anyone who rescues the missing leader would be well received by the rest of the Council and become a national hero in Amn. The Overlords of Murann: The monster army in Murann is too powerful for a direct assault by anything but another army, but some factions believe that key assassinations within the monsters' organization (particularly the ogre mages themselves) would destabilize it enough to cause a collapse. Calimshan is a land obsessed with wealth and unimpressed by magic. Its people are heirs to an old empire founded by genies; and now fear such creatures and ban them from their lands. Familiar with displays of magic, they see the Art as any other skill that can be learned. Some say the blood of the efreet runs in some Calishites, giving them sorcerous powers and a talent for fire magic. Calimshan is renowned for its chauvinism, exotic markets, thieves' guilds, decadent harems, desert landscape, and wealthy ruling class, as well as its enormous population and many slaves. Most Calishites rely upon mercantilism for their livelihood. The cutthroat politics of Calimshan involve backstabbing, layers of deception, and numerous advisors. The current ruler, Syl-Pasha Ralan el Pesarkhal (NE human male Wiz7/Rog12), reached his current position through lies, murder, and blackmail. Calishites are obsessed with titles and status, and an inappropriate look or remark from a person of lower station results in severe punishment. The people of Calimshan seek wealth not for wealth itself, but for the comforts and status it brings. Calishites believe that wealth is the reward for a life of work, and they look down, upon those who rely upon charity or "adventuring" to support themselves. Arcane magic is relatively common here, to the extent that half of the imperial guard are wizards. However, despite, a reputation for being a land of genies, Calishites avoid evocation magic (except for the efreet-descended sorcerers), planar magic, and teleportation, preferring conventional methods such as flying carpets. The business underworld comprises an important aspect of Calishite culture. Because a person's power on the surface and her influence in the underworld are considered two separate things, title ranks may vary greatly. The underworld is the only place in Calimshan where women are treated as equals to men. The rules for negotiations and meetings between underworld rivals are complex and delicate, involving proper forms of address, lying, and courtesy to the host. Calimshan extends along the northern coast of the Shining Sea for more than five hundred miles and includes all land south of the River Agis and the Marching Mountains. Calim Desert: This expanse of sand, salt, and rocks is not a natural desert, but the blasted battleground of two powerful imprisoned genies. When the minds of the genies become active, the desert rages with violent sandstorms. The sands hide the ruins of great cities which are said to still hold ancient treasures. Forest of Mir: This forest grows on rough, hilly terrain and is dense with a variety of monsters. Large numbers of evil goblins and smaller giants live here, establishing petty fiefdoms and occasionally raiding to the north or south. In the northern part of the forest, a decaying mythal around Myth Unnohyr guards many treasures, but the mythal turns helpful magic into harmful effects. Three Vhaeraunian drow settlements exist just under the surface near the foothills of the Marching Mountains. Marching Mountains: This forested mountain range has protected Calimshan's northern border for centuries, although its resident ores and ogres organize large raids every few years. Groups called Janessar have military outposts in the mountains, using their bases for their activities, most of which involve the betterment of the common folk of Calimshan, particularly the freeing of slaves. Spider Swamp: This hot, fetid swamp was formed when a great marid (water genie) was slain near two sluggish rivers. Inhabited by monstrous spiders, aranea (who trade for fine silk and rare herbs), bullywugs, and lizardfolk, the swamp is avoided by all but the most foolhardy. In the northern part of the swamp is Lost Ajhuuta, a submerged aranea city. A third of the three hundred aranea living here worship Zanassu (an aspect of the drow deity Selvetarm) tend toward neutral evil alignment and aggressive tendencies. Calimshan is unthinkably ancient, the oldest of all human lands in existence. Ancient ruins and magical palaces can be found in many places in Calimshan, now forgotten. Almraiven (Metropolis, 43,652): This port city is home to the country's largest shipbuilding facility. Aside from its whirlwind of mercantile and guild activity, wizards and sorcerers know Almraiven best as the premier center for magical study within Calimshan, a role the city has held for over three thousand years. Calimport (Metropolis, 192,795): In addition to its huge population of permanent free citizens, Calimshan draws large number of seasonal residents and transient traders. One of the oldest continuously populated cities in Faerûn, it contains two great arenas, large palaces, and impressive examples of just about any sort of building found elsewhere, including auction houses for slaves. Memnon (Metropolis, 29,101): Founded by the army of the efreet, Memnon is a garrison city, fishing port, trade stop, and secondary port for the country's navy. Memnon's warships and soldiers defend Calimshan from northern aggression and any evils that dig themselves free from ruined Memnonnar across the river. The city's outer walls are made of a dark, smooth rock that absorbs and shrugs off wear. Suldolphor (Metropolis, 143,657): A wealthy and intrigue-ridden city, Suldolphor is almost independent of Calimshan's rule, grudgingly paying taxes so its citizens may be left alone. Located on the strait connecting the Shining Sea to the Lake of Steam, the city is important to both Calimshan's trade and defense. Calimshan has long been the dominant power of southwest Faerûn, with a tumultuous recorded history spanning nine thousand years. It has always been a hot, damp, verdant land, suitable for growing olives and dates and grazing by huge herds of livestock. Its forests are filled with fragrant carving-woods, and its sandbars and coastal shoals bristle with oysters, crabs, edible fish, and rocks harboring both gems and metals. In short, Calimshan has always been a land worth fighting for and so there has been much fighting for it. In ancient times, the great forest Keltormir cloaked the region and was home to warring giants and elves. Humans also lurked in hiding among the trees, and the dwarves founded Deep Shanatar and flourished beneath the earth. Then came the mighty djinn from "otherwhere," geniekin and their halfling and human slaves led by the djinni Calim. They founded the Calim Empire, clearing trees from the lands south and west of the Marching Mountains, slaughtering or driving out dragons, and establishing a domain whose borders correspond with the Calimshan of today. The djinni ruled over humans in the Calim Caliphates for a thousand years before an efreeti of great power, Memnon, arrived from another "otherwhere" and established the realm of Memnonnar. The two empires broke into all-out war in the Era of Skyfire, a protracted struggle that so damaged the land that the elves used a form of great high magic to bind the spirits of Calim and Memnon into the ground and air, leaving them to struggle to this day in the sandy waste of their endless battle: the Calim Desert. Humans and dwarves overthrew the few remaining geniekin in mere decades. Coram the Warrior founded the realm of Coramshan over the ruins of the genie empire. Riddled by intrigues and dynastic strife, it soon fell under the sway of evil human priests, but arose again as the reunited realm of Calimshan. Yveraasahlisar the Rose Dragon conquered Calimshan and ruled for over a century before being slain - whereupon beholders seized power. Humans drove the beholders out and established colonies across western Faerûn, but plagues weakened their empire. Tethyr and the Vilhon Reach shook off Calimshan's rule and became independent. Human power in Calimshan peaked under the Shoon dynasty of a thousand years past. In more recent times, Calimshan has seen a Rage of Dragons (1018 DR), a Black Horde of orcs that slew its ruling Syl-Pasha (1235 DR), and the Time of Troubles (1358 DR), when the criminal underworld of Calimport was rocked by the death of all Bhaal-worshiping assassins. The current ruler of Calimshan, Syl-Pasha Persakhal, has made an alliance with Tethyr. He hopes to study its ways - and then annex the land. Old magic, cruel slavers, forgotten ruins, and dangerous hinterlands make Calimshan a perilous and exciting place. Outlander adventurers would be wise to choose their enemies carefully. The Secret Masters: Events and alliances in Calimshan have long been influenced by the Twisted Rune, a group of powerful undead spellcasters (including a blue dracolich) that meddles with mortal affairs for power and amusement. These spellcasters control portal leading to places across Faerûn and have hundreds of agents, most of whom don't know their ultimate masters. The Unseen Hand: Originating in Tashalar, the Rundeen is an association of merchants and traders that controls most of the shipping in Calimshan, using piracy to sabotage rivals. The Rundeen dabbles in slavery and fiercely opposes the Harpers, who have made several successful attacks against the group. Its primary motivation is profit; and the organization sponsors adventurers who aren't selective in their causes to assist in profitable ventures. Tethyr recently emerged from a decades-long civil war with two new monarchs. The strong rule of Queen-Monarch Zaranda Star Rhindaun and King Haedrak III (who for years served as scribe in Shadowdale to the great wizard Elminster under the name Lhaeo) is beginning to restore hope to a cynical suspicious, wartorn land. Tethyr is now growing, establishing ties with hesitant neighbors, and driving monsters from its lands. Its political situation still involves much intrigue, and the people distrust organizations that admit to meddling in others' affairs (such as the Harpers). The forest elves remain wary of the new rulers, for the last three kings sought to tame the great forest with axe, fire, and sword. The pirates living in the Nelanther isles to the west plague the kingdom's maritime commerce, including trade with far-off Maztica. Tethyr is an old, often fragmented land that lies between the economic powerhouses of Amn and Calimshan. It is a dry, hot, and yet fertile realm of pride and mounted knights, forests and farms, herds and wealth, with two peninsulas thrusting out into the Sea of Swords. The huge Wealdath Forest, still inhabited by elves, stands as its northern wall. The interior is a largely empty region of rolling grasslands. Most Tethyrians dwell along the Murann-Riatavin and Zazesspur-Saradush trade routes, and one in five is a halfling (with almost all others being human). Most of the well-made furniture, chests, and coffers in use in the Heartlands is Tethyrian or made in imitation of Tethyrian work. The realm is widely known for its superb wares, and Tethyrian guilds strive to promote excellence rather than controlling markets as they do elsewhere. Each of Tethyr's prosperous merchant families dedicates itself to a particular craft or trade good. Land equals status in Tethyr; the nobles either earned their land themselves or inherited it. The common folk are ruled by counts, who appoint local sheriffs from among the commoners to administer laws, muster militias, collect taxes, and support local magistrates. The counts in turn answer to dukes, and the dukes to the Queen. She is advised by the Royal Privy Council of the monarch, her heir or crown regent, eight dukes, and five religious and racial emissaries: the Archdruid of Mosstone, the Trespeaker of the Wealdath (elves), the Hills' Voice (halflings), the Shield Brother of the remaining Starspire dwarves, and the Samnilith, a spokesperson for the gnomes. The Queen directly oversees the standing army and judiciary. She has made Darromar the new capital of the realm, and it has risen swiftly to join Myratma, Riatavin, Saradush, and Zazesspur as an important Tethyrian city. Tethyr has many knightly orders sponsored by Ilmater, Torm, Tyr, and Helm. The most prestigious is the Order of the Silver Chalice, followed by the Champions Vigilant who worship Helm. Intrigue and opportunity have sprouted of late as Tethyr recovers its prosperity and grows larger - the cities of Riatavin and Trailstone seceded from Amn and declared allegiance to the throne of Tethyr in 1370 DR.
Travelers are warned that the number five is considered very unlucky in Tethyr. 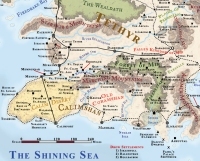 In terms of land area, Tethyr is one of the largest of Faerûn's realms. Much of this vast expanse of plains and forests is settled only sparsely. Omlarandin Mountains: Barely higher than the foothills around them, these mountains are legendary for omlar gems that are very suitable for magical uses. Only a few rare omlars have been discovered in centuries, but those have fetched princely sums from wizards. Wyverns and displacer beasts inhabit the area. Starspire Mountains: These low mountains contain treacherous and winding peaks. A few small clans of dwarves live here, enjoying their privacy despite the local perytons, displacer beasts, goblin tribes, ogres, and werewolves. The easternmost mountain is Mount Thargill, a long-dead volcano that is a secondary home to the dragon Balagos the Flying Flame. Balagos has imprisoned two dragons, a brown and a black, to act as guards. The Wealdath: Home of the two surviving local tribes of elves, the Suldusk and the Elmanesse, this forest also contains fey creatures that vigorously defend it against encroachers. Gnolls, lycanthropes, giant spiders, wyverns, and dragons (two greens, a brown and a gold) pose occasional dangers, although they have learned to avoid the elves. Portals leading to the plane of the lythari (elven shapechangers) exist in the forest, although only the lythari know how to open them. The castles of Tethyrian nobles - some now in ruins from the recent war - dot the plains and river valleys of the countryside. Darromar (Metropolis, 68,510): The new capital city and home of the queen and consort. Darromar has become the premier city of Tethyr. It boasts well-trained troops and draws many mercenaries, both for training and employment as brigand and monster hunters. A small academy here harbors sorcerers and wizards who have no intention of going south to Calimshan. Mosstone (Small Town, 1,713): This walled town is significant for its location along the trade Way, its collective government (ruled by townsfolk and nearby druids), and its proximity to the grove of powerful druids. The nearly two hundred druids associated with the grove work with the townsfolk to protect the forest and instruct those using the Trade Way how not to anger the elves of the Wealdath. Myratma (Metropolis, 51,390): This walled city is more like Calimshan than any other city in Tethyr. It is the port through which the country's agricultural products flow, and it is fighting to reclaim its honor after being the home of a rebellious noble family. Myratma has a paucity of sorcerers and wizards (most find employment in Calimshan), but the place is remarkable for the Jaguar Guard, a group of noble warriors brought over from the exotic land of Maxtica to the west. Riatavin (Metropolis, 85,650): Crucial in the flow of trade to a from the Sea of fallen Stars, Riatavin gained little benefit from Amn's Maztican colonization. Largely ignored by Amn's Council Six, Riatavin seceded to Tethyr in 1370 DR. Previously hidden sorcerers and wizards have revealed themselves to the city leaders show their support for the decision and aid in defending against reprisals from Amn. Velen (Large City, 14,389): Many ghosts haunt this fortified city, although the people are so happy and vibrant that visitors believe the hauntings to be greatly exaggerated. Important as naval outpost against the Nelanther pirates, Velen is also a valuable fishing port. Seafaring adventurers are quite welcome here. Zatesapur (Metropolis, 116,485): An amalgam of Tethyrian, Calishite, and other cultural and architectural influences, Zazesspur is a former capital of Tethyr and consists of two sections separated by the mouth of the Sulduskoon River. Ruled by a council of lords, the city resents its loss of prestige to the new capital of Darromar. Few wizards or sorcerers live here, because those fleeing Amn usually travel farther than Zazesspur; the city's proximity to Calimshan means those with arcane powers are quickly hired for a comfortable salary and life in the south. Once a great forest populated by elves, the land now known Tethyr has been overrun by giants, dragons, and djinn, given rise a great dwarven kingdom, fallen to the Calishites, harbored escaped slaves, and suffered through numerous political turmoils. The most recent of those was a civil war a generation ago that killed hundreds of thousands of people and resulted in the secession of one of its provinces. Two long-forgotten scions of the noble line have been placed on the throne and, with the Secret backing of powerful foreign wizards, have established order again. But certain people in power have ties to foreign interests and hostile powers, making the job of Queen-Monarch Zaranda Star Rhindaun (CG female human Ftr7/Wiz6) and King Haedrak II (NG male human Ftr2/Wiz6) that much more difficult. The new nobility, especially those not of Tethyrian blood, must still win the respect of their people. Tethyr's extensive wilds and unsettled lands are home to brigands, evil humanoids, magical beasts, and all other sorts of troubles requiring the attention of adventurers. Old Shanatar: At the height of the dwarven kingdom of Shanatar, the cities that are now Darromar, Memnon, Myratma, and Zazesspur were dwarven cities with extensive underground tunnels. Th entrances to the tunnels have been lost or forgotten; no human has set foot in any of them since the kingdom's fall, and they probably hold great treasures. However, old dwarven traps and constructs are sure to guard whatever riches are buried there.